What is Terroir and Why is it Important in Tea? Terroir is taken from the French term, terre, which means land and refers to the characteristics of an environment, the weather and growing conditions of a certain area that influence the growing of products such as coffee, wine, cheese and tea. Take wine for instance. If you take a grape, and you grow and cultivate that grape in two different countries, even if you use the same techniques to produce wine from that grape, the wine will always taste different in each country. A Cabernet Sauvignon from California, for example, will always taste different than the same grape and wine grown in France or Australia. It is the soil and conditions that contribute to the production and the taste of the wine. Search in Google and you will find many wine connoisseurs discussing what is and what is not regarded as terroir. It is such a complex subject, rich in debate and has divided wine connoisseurs around the globe. What does terroir mean for tea? There are so many components that affect terroir in tea. Climate is one of them. Some countries have a lot of rainfall; some have a high degree of sun; and in others, the wind can have an impact on the growing of the leaf. In some tea producing nations, there may be fruit trees or flowers that blow gently in the direction of the tea leaf. The floral or fruity bouquet can also have an influence on the tea leaf too. Mountainous regions and elevation has an impact on tea which can in turn, have an impact on consumer behavior. 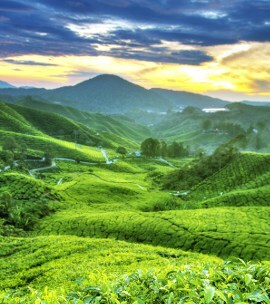 Tea grown in high mountainous regions are said to have a sweeter flavor profile. While tea grown in lower elevations are not bad teas, they just produce different tasting teas. Some tea plantations are often creative and poetic in their names to compensate for the perceived lower quality. In addition to terroir, tea connoisseurs talk not just about the environmental factors in cultivating the tea leaf, but the cultural factors as well. White tea was traditionally made in the Fujian province of China but in the last few years, India has also taken to producing white tea. White tea made in the Darjeeling region will always have Darjeeling characteristics to the tea caused by the soils and conditions, but can also be affected by the way that the locals produce tea there; the plucking, wilting and drying of the tea could also have an impact. Oolong was traditionally made in China and Taiwan, but now India has taken to producing oolongs, as well as newer tea producing countries such as Thailand. Each of the teas that are produced in these countries will have their own nuances in shape, color, and taste. No one tea is better than another; they are just different. Depending on different people’s palates, one might prefer a Chinese green tea to a Japanese green tea but it is entirely down to the individual. Terroir: whether it’s cultural or environmental or both, there is no doubt that terroir can have an influence on the makeup of the tea. Talking about tea, what’s in your cup?